Hanoi-based Thang is one of Vietnam's most exciting young artists today. He has exhibited widely with solo shows at major Vietnamese art galleries and exhibitions abroad such as the Ernest & Young ASEAN Art Outreach Programme, " Post Doi Moi: Vietnamese Art After 1990" Singapore Art Museum and "Connect: Kunstzene Vietnam" ifa Galleries, Berlin & Stuttgart, Germany. Like the great modernist painter Nguyen Tu Nghiem, he continues the country's long tradition of painting, digging deep into the country's rich history, culture and tradition for inspiration and examining their relevance and meaning in contemporary Vietnam. 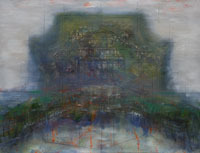 In his earlier series, the artist explored issues such as modernisation and its impact on the environment and urban landscape, and the effects of consumerism on Vietnamese society. The "Far in the North" series is part of the series of landscapes in Vietnam that the artist started working on over the last 3 years. Based on the artist's trip to various temples and pagodas in northern Vietnam, the artist recorded these places and their surrounding landscapes as they stood. Thang who earlier chanced upon the actual detailed architectural drawings of these places, could view how over time these structures and surrounding landscapes had changed or vanished. For the artist, it poses questions such as whether the reality that one sees is really the truth or one should probe deeper into the reality.